July 11th at 2:30pm and 8pm UTC kicks off our next installment of Meet Our Contributors YouTube series. This month is special: members of the steering committee will be on to answer any and all questions from the community on the first 30 minutes of the 8pm UTC session. More on submitting questions below. Meet Our Contributors was created to give an opportunity to new and current contributors alike to get time in front of our upstream community to ask questions that you would typically ask a mentor. We have 3-6 contributors on each session (an AM and PM session depending on where you are in the world!) answer questions live on a YouTube stream. If you miss it, don’t stress, the recording is up after it’s over. Check out a past episode here. As you can imagine, the questions span broadly from introductory - “what’s a SIG?” to more advanced - “why’s my test flaking?” You’ll also hear growth related advice questions such as “what’s my best path to becoming an approver?” We’re happy to do a live code/docs review or explain part of the codebase as long as we have a few days notice. 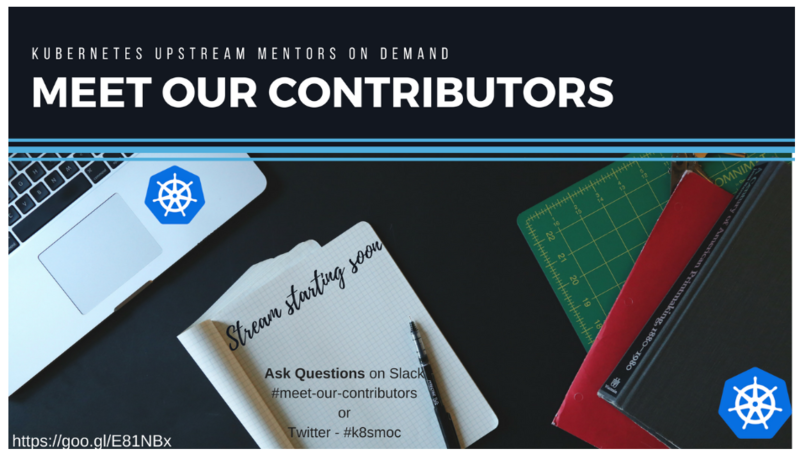 Join the Kubernetes Slack channel - #meet-our-contributors - to ask your question or for more detailed information. DM paris@ if you would like to remain anonymous. If you are contributor reading this that has wanted to mentor but just can’t find the time - this is for you! Reach out to us. You can join us live on June 6th at 2:30pm and 8pm UTC, and every first Wednesday of the month, on the Kubernetes Community live stream. We look forward to seeing you there!